This might just be me, but as a kid I hated just one single thing more than the dentist, and that was shopping for school shoes! Boring shops, full of boring shoes, with boring people fitting them, and boring conversions about why that shoe I was trying on isn’t “quite right for him” boring, boring, boring. And to be honest I still hate shoe shopping! 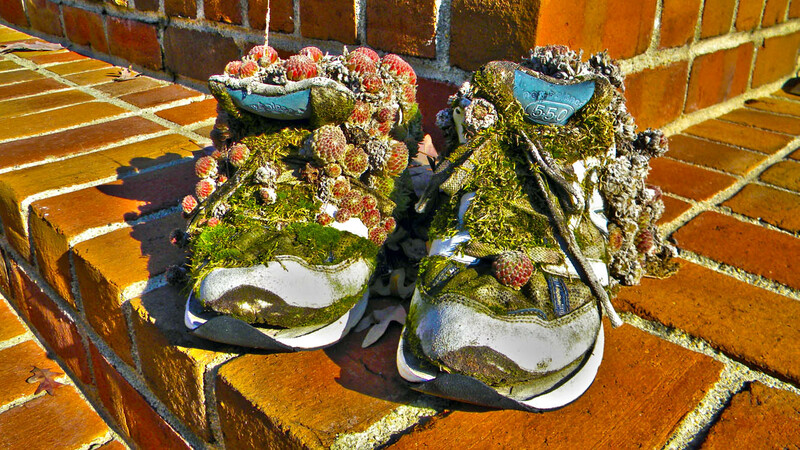 But I do have to wonder what ever happened to my old school shoes. The truth is they had become worn out and had to be thrown away, but maybe, just maybe someone picked them up from the top of the dustbin and did something very special with them indeed…. For me these kind of shoes are called “Crocks” but I get the feeling that people call them all sorts of things, whatever you call them this is a great way to keep them long after your feet have grow too big for them. Whenever I got new shoes my mum would always say “They are too big because you will grow into them!”, well it seems someone took that saying literally and grew an entire plant from a hole in the bottom of it, growing right through and out the top! Absolutely Amazing! 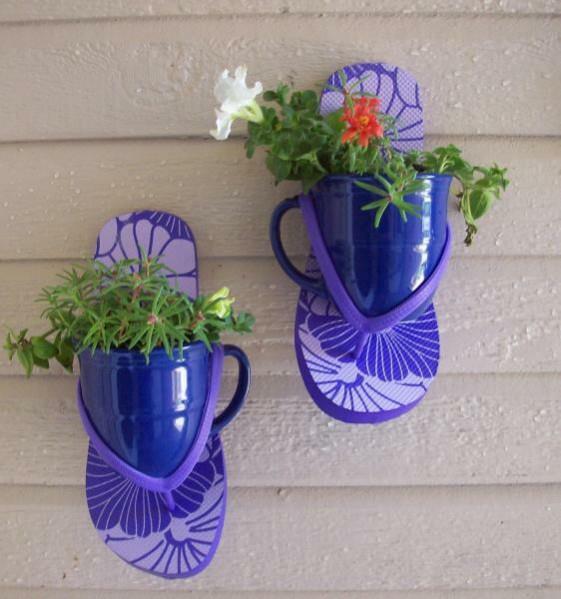 Over here in the UK we call these “Flip-Flops” because of the sound they make, well they won’t be making that sound any more because they have now been turned into these amazing plant holders! Great idea and best thing for them I say because I hate flip-flops! 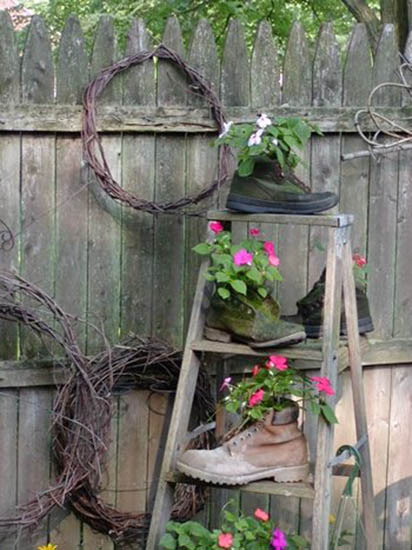 Not only a great use of old shoes, but a great use of an old ladder to stack them on! Double recycling and double the pleasure it brings. What you are looking at is a shoe that is wrapped in cabbage leaves then left for the succulents to grow over! While this one does require a much higher skill set to make it does look like it has grown into this shape! Truly amazing if you ask me. 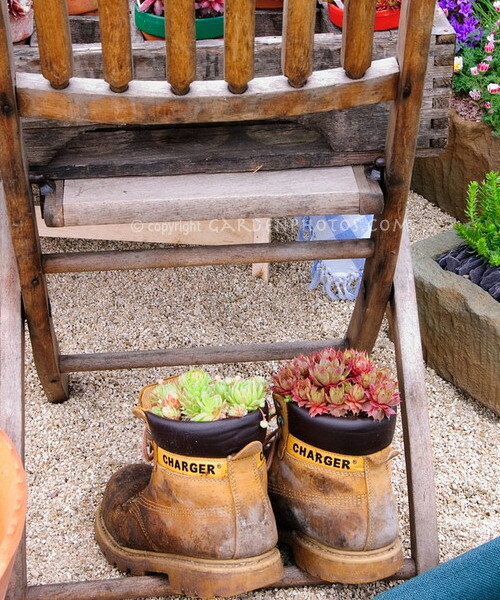 What a great use of some old steel toe capped working boots! 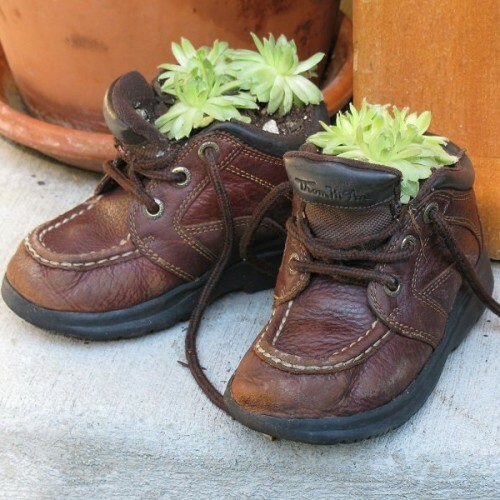 Just some simple succulents inserted into each boot and Bob’s your uncle you have an awesome looking Shoe planter! For me, this is what it is all about, some old shoes used too great effect and what better shoes to use than the ones our little ones have grown out of! So many happy memories and they are easy to turn into something beautiful for you to remember every time you see them. I think it is the fact that these are just sat on the brick floor of a house that could be yours, mine or anyone’s Simple, Urban and deadly beautiful, exactly the sort of thing I want to make myself. 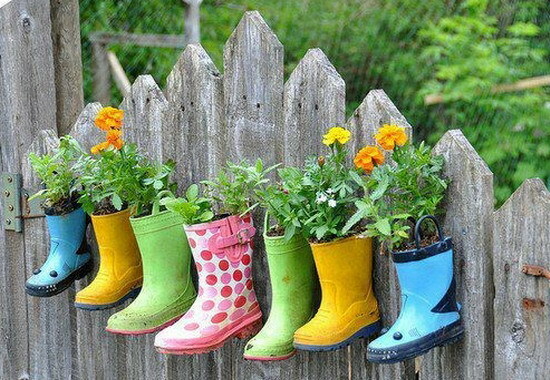 This for me is the clear winner, colourful rubber boots filled with colourful plants, it just doesn’t get any better than this and it’s a great idea to try with the kids old wellies.